FlexMove now manufactures Dorner’s 2200 Series flat belt conveyors from its Malaysia facility. FlexMove, a Dorner Holding Company, is a manufacturer of flexible chain conveyor systems for the food, beverage, automotive, electronic and automation industries. The 2200 Series is designed to move small to medium sized parts efficiently and quickly. The conveyor line underwent a redesign just last year to make this product stronger, faster and more flexible. It features a robust, single piece frame design that reduces the overall number of needed stands. The frame comes with a Universal T-Slot that is compatible with industry standard hardware and makes attaching accessories and guiding fast and easy. Additionally, a 5/8” nose bar transfer option with V-Guided belt tracking safely transfers parts at speeds of up to 200 feet per minute for increased productivity. New tool-less fully adjustable guiding provides customers with added flexibility to further customize their conveyors to best fit their needs. The low profile 2200 Series is a versatile line, and engineered for numerous applications and industries, including accumulation, small-part transfers, inclines and declines, automated and manual assembly, packaging and industrial. 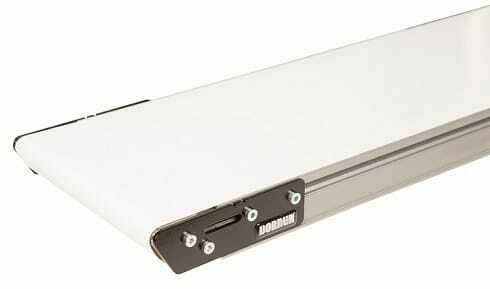 For more information on Dorner’s 2200 Series conveyors now at FlexMove, click here. Estoy interesado en adquirir algunos elementos para el desarrollo de ciertos conveyors, me encuentro en República Dominicana y me gustaría evaluar la forma en la cual podría adquirir estos elementos. Favor contactarme a mi correo para verificar opciones.